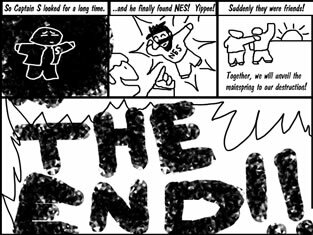 Comic #8 and a MEGA-UPDATE VLOG! SO many things to tell you, so little time in which to do so. First, we bring you the 8th installment in Maximo V. Lorenzo's Video Land Saga. This one highlights Max's brilliant ability to say so much without words. Now it's time for a long-awaited vlog, chock-full of exciting PBC news. It's a lot to digest, so consider this text update like show notes. As of next week, we will be PBC Productions, Corp. It has been our goal since day one to become a real company, and this past week that goal has been realized. We have been creating content for the web now for over a year, and it felt like the right time to "take the plunge." PBC has been taking on bigger and more exciting projects lately, and we only expect our impending incorporation to help solidify us as a legitimate production company. Brian Tang, former co-owner of NYClan, has started up a new site geared at gamers called goodgametv.com. The site is meant to be like TV for the web, bringing a line-up of high quality content geared toward gamers in the style of TV. The videos are high resolution, and the interface is simple. While they work the kinks out in beta, you'll be able to find Little Miss Gamer and Captain S season one. The most exciting news is that our next big web series will premiere, and be exclusively shown on goodgametv.com. What that series is, you'll simply have to wait to find out. After almost a year of blood, sweat, and tears, PBC's biggest project to date is complete. You may remember Chad and Brett travelling to St. Paul, MN last summer for the Puppeteers of America's bi-annual festival to shoot a documentary. Editing the doc has been a grueling task, but the film is finally ready for print, and it looks beautiful. The next step for us is to press the DVDs, which will then go for sale up on the PofA's website. PBC will also be entering the film into the festival circuit in the hopes of garnering some awards. We get e-mails almost every day asking about the future of Captain S. We're still not sure how to answer the question of WHEN, but we are in the thick of pre-production. Episodes are being written, and we're attempting to secure funding. To help us in that area, we've brough Ivy Hong on board as our sponsorship co-ordinator. We hope to begin filming this summer. Like season one, season two will be found exclusively on screwattack.com. If you haven't watched 'Life in a Game' yet, head on over to either screwattack.com or goodgametv.com and check it out. The show is clever and well-written, rife with video game homage. This sunday, Chad will be heading out to New Jersey to co-star on a future episode of the show. More news on this as the episode gets closer to air. From June 19th-22nd in the Dallas, TX area, screwattack.com will be holding their second annual Iron Man of Gaming tournament. It's a weekend-long event, with gaming tournaments from every era. PBC will be in attendance, filming the event for screwattack. For more information, head over to ironmanofgaming.com. On May 4th, Brett and Darrin will be in Reading, PA for the TooManyGames con. We'll have a table set up to sell merch, and there will be a Captain S showing. You'll also be able to find vendors, tournaments, cosplay, and a lot more. Pre-registration is only $5, so head over to toomanygames.com today. While Brett and Darrin are in Reading, Chad and Z will be heading down to New Orleans to film a documentary about 'Make a Smile,' a group of corrections officers from Central New York who are travelling to areas hit by Hurricane Katrina and building playgrounds. Chad and Z will be filming the process as well as interviewing people from the area. Finally, if you enjoyed the Konjoined Kitty Chad was sporting in the vlog, you can head over to konjoinedkitty.com to purchase one! In 1968, Leonard Nimoy covered the song If I Had a Hammer. 40 years later, PBC Productions pays homage to Mr. Spock's raw vocals and undeniable charisma in the most respectful and traditional way...Halo 3 machinima. PBC Productions has some pretty big news concerning the future of the company. More on that in the next week. Things just keep getting worse for Captain S. It seems that whatever is happening in VideoLand is way beyond his control. First it was random deletion...now this!? Stay tuned, dear readers, for another exciting episode in two weeks! Oh, btw: PBC will be screening their unreleased documentary on the American puppetry scene- "Puppet Rampage" - at their alma mater, SUNY Fredonia, this Saturday. The Fredonia Gamers Guild and the Media Arts Club are sponsoring the event. A crazy Smash Bros. tournament will follow the screening. And thus concludes the epic VideoLand Saga of Captain S. Big thanks to Maximo V. Lorenzo and all the PBC staff. See you next year!